Most important thing you need for healing with a crystal ball is "CLAIRVOYANCE"
Clairvoyance means clear seeing, into the future, into the past, into other dimensions and beyond the physical eye range. We all possess clairvoyant powers, but the modern busy world means that we do not often use them and so we may miss opportunities and hazards. But you can easily learn to use these powers to make decisions and to see what lies ahead. You can also discover past lives and see your angels and spirit guides. Clairvoyance works mainly through seeing images though you may also get information in words and as feelings or impressions. You may see these symbols in your mind or within a large crystal you can use for focusing your clairvoyant powers, for example a crystal ball or a crystal pyramid. One of the most effective and easiest methods is the crystal ball. Clear natural quartz crystal balls with marks that look like cracks, inclusions and sparkling rainbows are best for clairvoyance. Some people mistakenly think these are broken but ones that are totally clear inside are much harder to use. 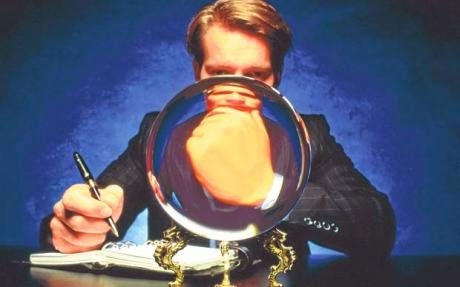 Anyone can read a crystal ball with markings in it as the cracks form physical images that help the psychic or clairvoyant eye to pick up the hidden psychic information they hold. Clear quartz crystal can be used in sunlight, moonlight, or by candlelight. Amethyst crystal balls are good for answering questions about healing and health, for matters concerning the past, for complex relationships such as love affairs or step families, for issues concerning women, for issues of guilt and blame, spiritual matters, private worries, fears, and addictions. Amethyst is best in moonlight or candlelight. Rose quartz is good for questions about love, family, animals, fertility, self-esteem, the home, and children. Good in moonlight or soft natural light but not bright sunlight. Not so effective with candles. This is the simplest method but spend a few minutes just looking for images in the ball so your eyes get attuned to crystal pictures. Either light a candle so the light shines in the ball or work with sunlight or moonlight. Turn the ball round in the light and allow pictures to form within the ball one after the other, using the cracks and lines within to make spontaneously the shapes of animals, birds, stars, scenes, and people. Choose the clearest or largest image first. What is it saying about your question? For example a boat on a stormy sea with land ahead says that the changes you are making or planning are difficult but you will soon reach your desired goal. You may hear words in your mind or feelings and impressions that will add information. Sometimes your chosen image will change into a second image, but of not turn the ball gently in your hands and focus on the next clearest image. Keep choosing images until you can see no more. Now totally relax and just write everything that comes to mind about those images however seemingly unrelated. Do not read what you have written until you have finished writing. As you read what you have written the answer to your question will become clear. It is okay if you do not see any images the first several times you use the ball. Most people need practice at achieving the necessary receptive and relaxed state of mind before images will appear. Crystal ball gazing takes a lot of practice and patience, but in time you will become more receptive and more adept at reading the crystal. This is an alternative slightly more complicated method using a crystal ball and you can as I suggest to adapt it for understanding past, present and future concerning an issue. If you prefer you can use three images as three aspects of the same question as seen from where you are now. By seeking just three key images and interpreting those as a sequence in relation to the question asked you can usually get to the heart of any matter. This time expand each image in your mind to extract as much information as possible from it and any associated ideas before moving on to the next. If alone record your thoughts aloud on tape or scribble down impressions. First focus on the question and any possible time frame, weeks, months or years. Look towards the centre of the ball and name aloud the first clear image. What words come into your mind and what do you feel about the image? For example if a bird is it a flying bird, a nesting bird, a caged bird? What species of bird is it? Is it one you like or fear? Is the cage door open and does the bird want to stay inside? Now identify another image and then a third. Try to obtain as much detail as possible. Even if you cannot get much form the crystal ball image close your eyes while holding the ball and see it in your mind and its background/context. You may decide to use to first image to interpret what it is from the past that is relevant now, the second as crucial but maybe hidden present information and the third as the possible steps to future happiness or the outcome of planned change or action. Whether or not you do this or use the three images to expand the current issue, try to weave the three images together and see what they are saying For example the bird sitting inside the cage that is open may be too scared to fly out, may not want to or not realize the door is open. Who is the bird (usually the person who has asked for the reading)? What is the cage? A relationship, a job going nowhere, a home that has become confined, suggesting that relocation would be desirable? How do the other images expand the theme or give direction? Whether alone or working to help someone else you can weave the images together to find a solution and a way ahead. Creating a beautiful working place for clairvoyance work helps your everyday mind to relax into a softer more intuitive mood so that you can more easily access hidden information. Light incense if working indoors whether as cones, sticks or granular incense that burns very beautifully and easily on charcoal disks in frankincense, myrrh, sandalwood, benzine, rose, pine, jasmine, magnolia or musk. Alternatively burn floral fragrance oils in an aroma lamp or any of the above fragrances. Scented or white candles will not only shed light on the ball but open your psychic awareness of what you sense as well as what you see and hear. Place four protective crystal, glass ceramic or metal angels to stand at the four corners of your table (optional).